HomeAccelerating TechExtra! Voyage of the Space Roadster! February 8, 2018 Phil Accelerating Tech, Podcasts, Transformations, Transition Comments Off on Extra! Voyage of the Space Roadster! 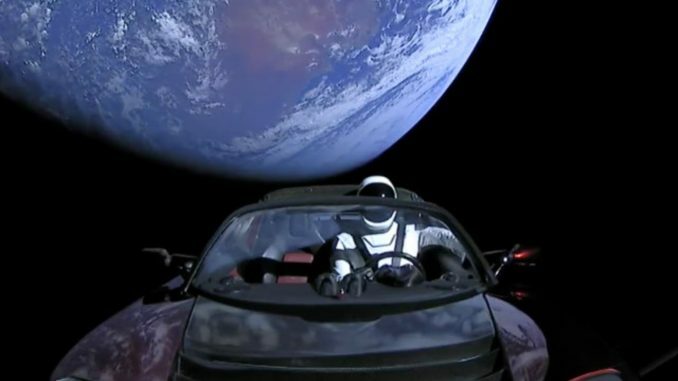 Phil and Stephen reflect on the launch of the SpaceX Falcon Heavy rocket, and Starman’s drive to the asteroid belt. What is Elon Musk up to? Is this all just a publicity stunt? Or was that just a publicity stunt that NASA pulled back in July of 1969? Interesting times lie ahead for both NASA and SpaceX. Is it time NASA got out of the rocket business? Let’s discuss! Hat-tip to Brian Wang at Next Big Future for his outstanding coverage of this story. NOTE: Phil repeatedly uses the term “Orion” to refer to the NASA Space Launch System (SLS) . The World Transformed regrets the error.